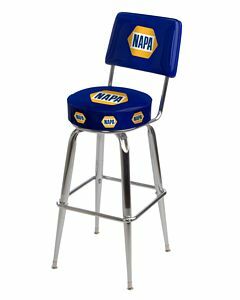 Advertise your brand at the point of sale with BarStoolsandChairs.com's custom logo bar stools. Our logo bar stools are the best available. Each stool is hand printed, hand cut, hand sewn, and hand upholstered in the USA. All printing in done on the underside of commercial grade 12 mil clear vinyl. You never have to worry about your logo scratching off the seat with our bar stools. We can Pantone match any corporate color or even print your photographs. All logo bar stools come standard with a 360 degree swivel. We have a two piece minimum for our custom logo bar stools.If you are intersted in larger quantities, our price breaks are at 25, 50, 100, 250, 500, and 1000 pieces. Please email us with your artwork, quantity desired, model number, and destination zip code for a custom quote.